Little Man is attending a Dallas Cowboys Football Day Camp this week. This is the crazy, mad-house scene I encountered today when I went to pick him up. 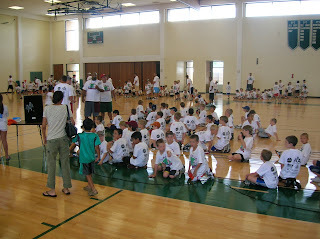 There are over 400 boys in this camp (6 to 12). It was chaos. 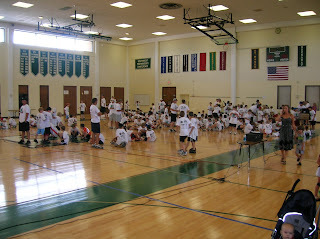 They are learning football fundamentals and basic stuff. No contact. Just flags. And there are several Cowboy players who will make an appearance this week to talk to the boys and give them pointers. Like "Don't shoot heroin". "Get a money manager, don't blow all your money on fast woman and drugs like I did." "Don't get arrested at 2 in the morning with a gun in your car". Just kidding... I'm sure it's all about dedication and staying in school. Player appearances include: Felix Jones, Anthony Henry, Kevin Burnett and 2 more mystery players. What the... I never heard of any of these guys. Where's T.O.? Where's Romo? Well, he's probably busy with Jessica Slutson. And T.O. 's working on his TV career, so I guess that just left the rookies. And get this, they wanted $25 PER PLAYER to take a photo with the player and your child. For some guy I never heard of who will probably not be there in 2 seasons. What a rip. I declined that opportunity. Little Man is enjoying the camp. That's what counts. Man, it's good to be eight.